Synopsis: Perpetual scaredy-cat Conor O'Neill has the fright of his life when a banshee girl named Ashling shows up in his bedroom. Ashling is--as all banshees are--a harbinger of death, but she's new at this banshee business, and first she insists on going to middle school. As Conor attempts to hide her identity from his teachers, he realizes he's going to have to pay a visit to the underworld if he wants to keep his family safe. Synopsis: The eagerly awaited addition to the series begun with the New York Times best-seller Life As We Knew It, in which a meteor knocks the moon off its orbit and the world changes forever. Love both covers this week. 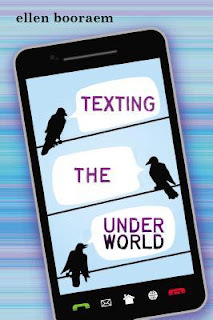 And love the synopsis for Texting the Underworld. 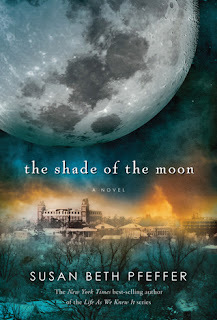 Then the Shade of the Moon is from a series of books that I've read the first couple of and loved! I need to reread because it's been so long. I'm excited to see there's a 4th book in this well written series. OOh nice! Both are new to me! Hope you enjoy them both once they're out! Great picks! I haven't heard of either book yet, but they both seem interesting. I really love Shade of the Moon's cover. Thanks for sharing! Ooh...what a great description: "This totally fresh take on the afterlife combines the kid next door appeal of Percy Jackson with the snark of Artemis Fowl and the heart of a true middle grade classic." I love the mix of these two books and I definitely want to check this one out!